If you’re heading to the tropics this winter, along with visions of palm trees and tropical sunsets, you might have plans to snorkel or scuba dive on the coral reef. But did you know that the sunscreen you wear could be damaging to this beautiful, yet threatened ecosystem? Chances are if you just pick up a sunscreen at your local drugstore, you’ll unintentionally be leaving behind a slick of destruction on your trip. Some 3,500 brands of sunscreens world-wide contain oxybenzone, one of the active ingredients shown by research to promote bleaching, or the release of the symbiotic algae that feeds the coral. The scale of the problem is immense. Between 4,000-6,000 metric TONS of sunscreen wash off bathers into the world’s waters every year. I’ll never forget the first time I noticed this, after a large group was dropped on the coral reef to snorkel nearby where our Ocean Matters group was scuba diving in Grand Cayman. When we surfaced, there was a large slick of sunscreen visible on the surface from the group of snorkelers. 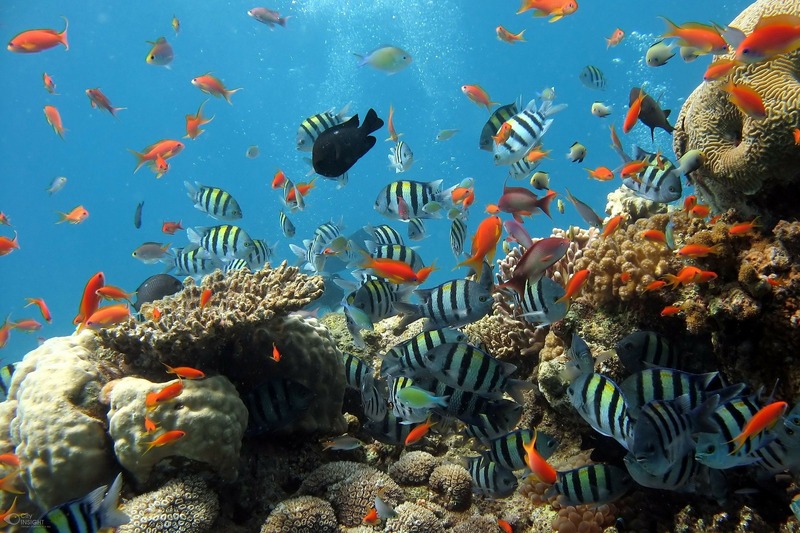 Up to 10% of coral reefs are estimated to be adversely impacted each year from sunscreen alone. Given that up to 90% of world’s coral reefs are already threatened by other man-made stressors such as warming waters, nutrient runoff from fertilizers, and ocean acidification, additional pollutants like sunscreen can make the difference between coral recovering or dying. So what are we to do if we care about the ocean and the animals that make it their home? There is much confusion in the marketplace about which sunscreens are actually safe. Some sunscreens advertise themselves as reef safe, but contain one of the these four ingredients: oxybenzone, butylparaben, octinoxate and 4-methylbenzylidine camphor, all of which have been shown to cause coral bleaching even at low levels. To be sure that you have a truly reef safe sunscreen, you’ll need to be a careful consumer and read labels. No sunscreen is perfectly safe and healthy for us and for the reef, so try to minimize your use by covering up whenever possible. Wet suits, brimmed hats, and sunglasses are truly one of the best ways to be sure your impacts to the reef are minimal. The EWG (Environmental Working Group) has done extensive research on this topic and will be soon releasing a 2018 guide to sunscreen buying. Here are a few of the sunscreens EWG has recommended in the past with links to purchase on Amazon. Ocean Matters participates in Amazon’s nonprofit program, so each purchase through these links returns to us a small portion to help support our scholarship programs. Because the ocean matters. . .and so do you! Donate to support our education programs (100% goes to education as we have an all volunteer staff.) Any donation of $30 or more will receive this Blue Marble Earth flag for free (a $22 value) as our thank you. Laura Parker Roerden is the founder and executive director of Ocean Matters and the former managing editor of Educators for Social Responsibility and New Designs for Youth Development. She serves on the boards of Women Working for Oceans (W20) and Earth, Ltd. and is a member of the Pleiades Network of Women Leaders in Sustainability. This entry was posted in Ocean Matters Blog and tagged coral reef conservation, reef safe sunscreen, sunscreen. Bookmark the permalink.